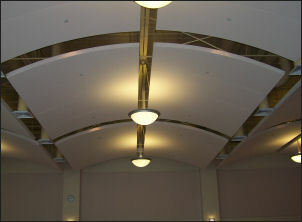 Acoustic Ceiling Baffles ANC-600P from All Noise Control are a superior product solving any reverberation problems. It is ideal for applications which require baffles that have a “crisp” corner and a finished face. This makes our ANC-600P ceiling baffles have an aesthetic finished look as well as superior noise control and sound absorption properties. The ANC-600P Acoustic Ceiling Baffles is 1 ½ ” thick in standard 2’x4′ sizes. They are available up to 4’x8′ for larger applications. Installation Instructions: 24″ – 35″ apart over an entire reverberant area can result in a 4 – 12 decibel reduction in general noise.